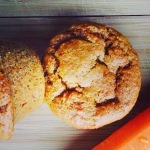 Gluten Free Carrot Date Muffins – Dr. Melissa Lee ND., RAc. This isn't your typical muffin. Its a gluten free one.... which means it has potential right? I do admit I was quite skeptical, but my patient had given me assurance that it was delicious. This is also quite the nutritious breakfast muffin: it is full of fruit, veggie, nuts and natural sweeteners. It is a great healthy option for your family and children. Soak your dates in water for 20 minutes before you start to bake. Then blend them up in a food processor or mash them by hand. This will be your sweetener. Combine your almond meal, nutmeg, cinnamon, baking soda and mix together. Set this aside. In a separate bowl smash your bananas and blend with your dates, and coconut oil. Then add your cidar vinegar and immediately fold in in the dry mixture. Bake at 350 degrees fahrenheit for 25- 30 minutes. Keep an eye on these and ensure they are cooked inside. This it is a denser muffin (not like a brick, but it is dense); and because this muffin is full of shredded fruit and veggie, it turns out a little more moist then usual. It may take 2 -3 tries to get the texture to your liking. Also, sometimes almond flour takes a little longer to bake And ovens may vary.